The newest updates are always listed on the Index Page of this website. December 26, 2018 Initial Page for Eastward bounded rates fro the rates from the French Mandate in Syria and Lebanon, Alawite State / Government of Latakia created. Some details are still missing bit already worth checking as 2 covers sent in 1932/33 from Safita in the Alawite State / Geoverment of Latakia to Nasiriyah/Iraq are shown. December 22, 2018 Award (Gold, 85 Points) received for the Website at Italia 2018 Literature Exhibition added. December 3, 2018 Details of a record in the UN-Archive regarding the termination of Mail Transport Contract between Palestine Post and Nathaniel Transport company added. December 1, 2018 In the Forerunner section i have added the Postal Regulations from the German State of Saxony for Mail to Baghdad via the Syro-Iraqi Desert. November 23, 2018 Letter copies of original correspondence sent by the American Embassy in Persia as well as the Department of Commerce in Washington, USA. October 13, 2018 A newspaper article from the Adelaide Mail dated 1 September 1923 added where the new Overland Mail has already been described. In fact, a very early newspaper article describing this service. October 12, 2018 A contemporary map of 1851 showing the various Overland Mail routes from Europe to India has been added. October 3, 2018 A manipulated cover sent in 1929 from India/Bombay to Iraq added. September 27, 2018 Postage Rates and Overland Mail Surcharges for Egypt have been completely revised as per the current state of research. The date when the Overland Mail surcharge has been abolished is still unknown. September 24, 2018 Postage Rates for France have been revised, in addition French registration fees added. September 16, 2018 I was able to find 2 covers from Canada to Iraq dated 1929 respectively 1930 from the time when the surcharges have been withdrawn. Images are uploaded, Details will follow shortly. Copy of cover with most likely Route Instruction Handstamp HS-46 (1) added. August 9, 2018 The English translation of a interesting letter sent on November 28, 1923 from the Belgium Ministry of Railways, Navy, Post and Telegraphs to the Secretary of the General Post Office of London, inquiring about the use of the Overland Mail Haifa-Baghdad by the Belgium Post by using English stamps for the surcharge and Belgium stamps for the postage. July 26, 2018 New discovered Route Instruction Handstamp now listed as HS-N60 added. That Route Instruction Handstamp is similar to HS-23, HS-24, HS-25, HS-N03 and HS-N41 but with slightly different size. July 20, 2018 Created the first page of the a Forerunner Section, in which i became interested recently. Stay tuned for further updates on that interesting area. June 21, 2018 Postage rate table for Belgium has been updated. June 7, 2018 A new page has been created which tries to explain then End of the Overland Mail Baghdad-Haifa. That topic is not yet much researched so information provided on that page is some sort of historical facts mixed with some assumptions. The latest cover sent eastwards of which I am aware of is however shown. June 3, 2018 After 20 years of collecting the Overland Mail i can finally show a cover with Route Instruction Handstamp HS-12 (1). June 2, 2018 A letterhead from the Eastern Transport Company, the company that was taken over by Nairn Transport Company, added. 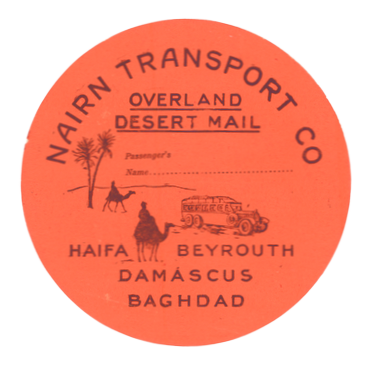 May 18, 2018 A dedicated page with my philatelic articles/writings related to the Overland Mail Baghdad-Haifa has been added. April 21, 2018 Transcript and English translation of Dienstorder 38 of 19 January 1927 of the Dutch/Netherlands Post has been added. April 20, 2018 Dienstorder 38/1927 from the Dutch / Netherlands Post, indicating the surcharges for the Overland Mail Haifa-Baghdad / Autodienst, added. A transcript and English translation will be added shortly. April 3, 2018 Another cover with Route Instruction Handstamp HS-88 (3) on cover from Teheran to Italy added. The Revision History Pages have been split into yearly pages for easier viewing/handling and a separate submenu for it has been created. April 1, 2018 On the request of some collectors i have created pages which group the Eastwards and Westwards countries as per the grouping in the contemporary literature. March 31, 2018 Further cover with Route Instruction Handstamp HS-20 (3) added. A Picture Postcard sent in 1930 from Port Said / Egypt to Baghdad / Iraq apparently as printed matter. March 29, 2018 A further cover with Route Instruction Handstamp HS-04 (3) added. After comparing the other covers with Route Instruction Handstamp HS-04 if may be that the cover with handstamp HS-04 (1) in fact is a different handstamp but the quantity of items known does allow so far for a clear judgment. Newly found Route Instruction Handstamp, now listed as HS-N57 on a cover from Baghdad to England. Sender is the again Ezra Moshi Shayaa, the same sender who is known as having used HS-04 (2 and 3). March 28, 2018 Started to completely revise the Postal rates and Overland Mail Surcharges from Iran, reflecting the current state of research. So far a total of 8 Rate Periods could be noticed! This revision work for the Rate Periods pages is ongoing, please be patient! March 24, 2018 Comprehensive table with Postage rates and surcharges from the French Mandate of Syrian and Lebanon, relevant to for mail sent by the Overland Mail has been added, in addition, scan of the relevant decrees have been uploaded. March 19, 2018 Another manipulated item added, this time a 1922 cover from Basra/Iraq to Egypt with an Overland Mail Route Instruction Handstamp. But, in 1922 the Overland Mail was not yet in operation!!! Another cover with Route Instruction Handstamp HS-N35 (3) added. New found Route Instruction Handstamp, now listed as HS-N56 on a cover from England to Baghdad added. March 15, 2018 After having received some new purchases i can add a new discovered Route Instruction Handstamp which i have earlier believed to be another copy of HS-N07 but after having measured it it turned pout to be a new discovered Route Instruction Handstamp, now listed as HS-N55. March 2, 2018 Another cover with Route Instruction Handstamp HS-N35 (2) added. February 23, 2018 High resolution scans of cover sent in 1929 from India to Palestine through the Syro-Iraq Desert / Overland Mail was added. Description of that cover will follow shortly. High resolution of cover with route Instruction Handstamp HS-N16 (3) which has been measured added. February 19, 2018 Cover with Receiving Handstamp RH-1 (6) has been scanned, the handstamp measured and the images in high resolution of 600 dpi uploaded. February 17, 2018 Images of an Underpaid Cover / Postage Due) from Iran to Beirut added. February 16, 2018 Registered cover from Baghdad to South Africa with Route Instruction Handstamp HS-15 (3) and rare postage rate of 18 Annas added. Cover sent in 1929 from India to Palestine through the Syro-Iraq Desert / Overland Mail was added. A new chapter for Underpaid Mail / Postage Due covers has been added which will be filled in due time. February 10, 2018 Route Instruction Handstamps HS-N15 and HS-N16 are puzzling me more and more. Three additional covers with these Route Instruction Handstamp have been discovered and I hope with the analyze of the transport route i can decipher where the Route Instruction Handstamps have been added on the covers. Currently it seems that these handstamps were used on the transit route through Egypt, both on east- and westwards bound covers. The new covers are here: HS-N15 (5), HS-N16 (3) and HS-N16 (4). If any collector is having images of additional covers with these handstamps i am thankful for any image. February 9, 2018 Completed to add the postal regulations from the Czechoslovakian Post pertaining the Overland Mail Baghdad-Haifa in Czech and English language. February 8, 2018 Started to add the postal regulations from the Czechoslovakian Post pertaining the Overland Mail Baghdad-Haifa. The information will contain the Czech language transcript and the English translation of the same. January 30, 2018. New discovered Route Instruction Handstamp HS-N54 found on a cover front dated18 April 1931 from Iraq to England added. January 27, 2018. After having only one cover with Route Instruction Handstamp HS-N15 in my collection for several years, all of the sudden a total or 3 more covers appeared. All from different senders and even countries. So it puzzles me where this handstamp has been applied!!! Here are the new covers with apparent Route Instruction Handstamp HS-N15 (3) and HS-N15 (4). Any information is welcomed. January 26, 2018. Colored copy of over with Receiving Handstamp RH-1 (6) added. Also a original scan of the cover indicated in news dated January 10 with HS-N15 (2) and HS-N16 (2) have been added with the handstamps correctly measured. Still i am not sure where these handstamps have been applied. January 12, 2018. I just have learned about the apparent existence of surcharges issue by the Czechoslovakian Post. Stay tuned for detailed information. January 10, 2018. Another cover with apparently similar handstamps as HS-N15 (1) & HS-N16 (1) from Iraq (22 July 1924) to Italy (arrival postmark reverse (16 August 1924) added. That cover is not (yet) in my hands, hence the size of the handstamps HS-N15 (2) and HS-N16 (2) can not be verified. I believe that cover was not sent by the Overland Mail as during that time the rate would be been 9 Anna for a registered cover sent with the Overland Mail. Also the transit time of almost 4 weeks supports this. But, where the Overland Mail / Motor Mail Markings have been applied? January 3, 2018 Regulations from Swiss Post pertaining the Overland Mail Surcharges as of 25 July 1925 (2nd surcharge period) added. Also a cover from that surcharge period added.